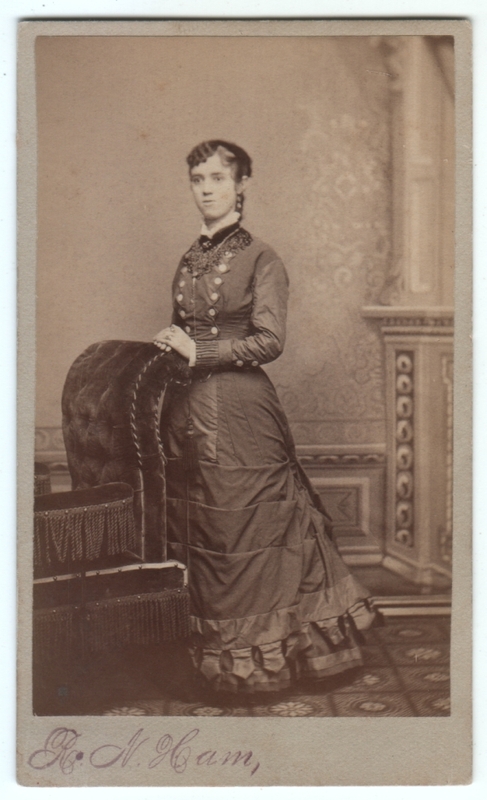 Carte de visite (CDV) photo measuring just under 2.5 x 4.25 inches. Photographer is R. N. Ham of Chicago. Otherwise undated and unidentified. Not much to say about this one, just another pretty photo from the past. Okay, I have to admit that dress looks like it’s designed to carry around carpentry tools in the front pockets, but I still think it’s attractive. 🙂 By the way, do you see the spot on the side of her face? I can’t tell if that’s some sort of foxing or accidental smudge, or if it was an effort at tinting her cheek. Oh, yes, don’t worry, I knew they were pleats, fortunately I’m not that inexpert. 🙂 It’s just that to my modern eyes they look like giant pockets, and the trim looks like the edge of an awning. Thanks for the extra information! She reminds me a bit of Winona Ryder in The Age of Innocence. I see what you mean. To me, her face has a bit of a Bernadette Peters quality.